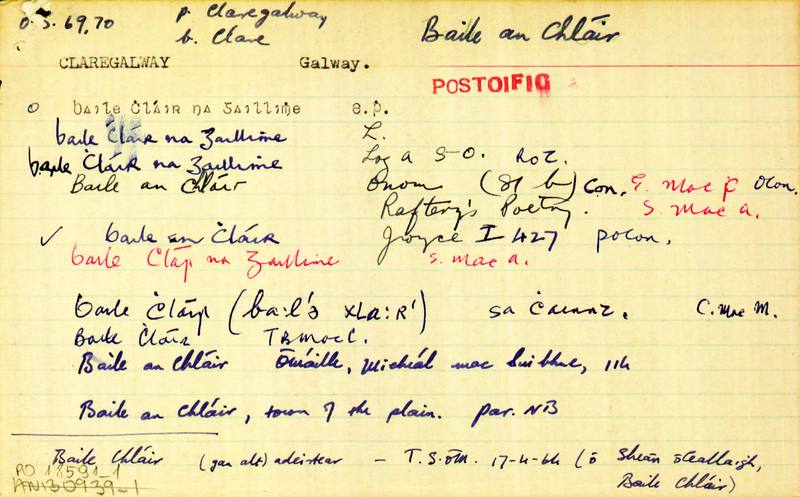 Until about the 1950s, the dominant language in Claregalway was Gaeilge (Irish). Although Claregalway (or Baile Chláir) is still officially designated a Gaeltacht, very few people speak the language today outside of school. Ba i an Ghaelige gnáth-theanga mhuintir Bhaile Chláir i dtús na fichiú aoise agus is feidir liom fein fiannaise a thabhairt go raibh an Ghaeilge á húsáid go forleathan suas do dtí na blíanta thart ar 1950. Bhí sé de nós ag an am sin ag fir an pharóiste tamall a chaitheamh ag comhrá agus ag inseacht nuachta dhá cheile taobh amuigh den seipéil tar éis aifreann an Dhomnaigh. Bhíodh na buachaillí óga, mar mé féin, ag seasamh in aice leis na fir, agus is cuimhin liom gurbh í an Ghaeilge a bhí dhá labhairt ag cuid mhaith doibh cé go raibh Béarla dhá labhairt ag cuid eile. Is e mó bhariúl go raibh tuiscint mhaith ar Ghaelige ag 90% do mhuintir na pharóiste agus go raibh liofíocht sa Ghaelige ag 50% ar a laghad. Bhí aithne go pearsanta agam ar gaeilgeoiri líofa ó Eocaill, Mullacurtra, Leacht Seoirse, Bóthar Bhaile Chláir, Cluain Biggin, Móinteach, Ceathar Gabhann, Clochar, Cluain agus ar an taobh eile den bothar mhór: Creag Bhuí (Baile Fánach), Radharc Locha (Turlach Bréige), Gort an tSléibhe, Baile Ui Mhurchú, Bhaile na Creige, Cinn Uisce agus Chill Tróg. Chomh maith le sin bhí an Ghaeilge a labhairt go forleathan in san gceantar thart timpeall ar Scoil Cairn Mór. San am sin freisin bhí an Ghaeilge go coitianta in sna tighe Ósta, go h-airthe i dtigh Ósta Ó Leanachan agus is gaeilgeoir líofa a bhí sa bhean tí, Bina agus a dearthaír Tómas. I rith na mblianta sin bhí Tomás Ó Conchubair ina mháistir scoile i mBaile Chláir, fear a raibh sar-mheas ar an teanga aige agus rinne se obair dhían ar son na teangan. Tar éis na g-caogadaí bhí athrú mór ag teacht ar an saol agus bhí damáiste mór déanta ag an imirce ó thaobh teanga agus chultúir de, agus nuair a fuair glúin tús na h-aoise seo bás, faraoír, fuair an teanga nadúrtha bás leo. Baile beag socair in ascal abhainn an Chláir is ea Móinteach. Ta sé suite míle Éireannach díreach siar ó Bhaile Chláir. Áit stairiúl é ina bealach féin a bhfuil cáil fé leith sa duchas mar gheall ar an iascaireacht mhaith atá le fáil gar don bhaile. San meán aois bhí mainistir agus manaí ar an mbaile agus tá an áit ar a raibh an mhainistir tógtha le feiceál fós. Tugtar an lisín ar an áit agus bhí muintir an bhaile dá úsáid mar chillín nó roillig do pháistí beaga a fuair bás anuas go dtí 1932. I dtús an octhú aois déag bhi scoil ar an mbaile (cineál hedge school is dócha) agus d’fhoghlaim cuid mhaith de mhuintir an bhaile léitheoireacht agus scríobhneoireacht. Príomh ghné don scoil sin nach raibh cead ag na páistí Gaeilge a labhairt agus uair ar bith a chuala sé páistí ag labairt Gaeilge sa scoil chuir se píonós orthú. B’fhéidir gurb é sin an fá gurbh é Mointeach an áit deire i bparóiste Bhaile Chláir in a raibh Gaeilge mar gnáth theanga. I dtús an chéid seo bhí dhá scór teaghlach ar an mbaile. San mblian 1908 tré scéim Coimisúin na Talun fuair roint teaglaigh feirmeacha i gCill Tróig agus ar an gCroisín. Ba iad sinn muintir ó Dúbhagáin, Ó Móráin, Ó Murchú agus O Nuadhain. Chomh maith le sinn chuir imirce isteach go mór ar an mbaile agus thart ar an mblian 1950 ní raibh ach 17 teaglach fágtha agus daoine sean a bhi i gcuid maith dóibh sinn. Ba cheart a rá go raibh an gaelachas agus an náisiúntas go láidir i gcónaí agus nuair a tháinig tacaí Liam Mellows ar an mbaile i 1916 chuaigh seisear amach leo cun seasamh ar son óglaigh na Cásca. Ba iad sin Séan Ó Conceanainn, Domhnaill Ó Dubhagáin, Annraoi Ó Dubhagáin (Liam), Tadg Ó Dubhagáin, Tadg Ó Corcaid agus Annraoi Ó Dubhagáin (Seán). Buíochas le Dia tháinig siad ar fad abhaile slán. Mar gheall ar sin is dócha tháinig na Dubh Chrónai (Black & Tans) chuig an mbaile trí huaire ach bhí an Bush Telegraph ag obair go maith agus dá bhrí sin bhí fir óga an bhaile imigh “Fé thalamh”. Le gairid anuas sa mblian 1960 d’fhág cúig teaghlach eile an baile faoi scéim eile Coimisúin na Talún agus bhain sin an croí agus an gaelachus amach as an mbaile. Mar sin féin le blianta anuas tháinig ceithre teaghlach nua isteach agus tá fáilte rómpa agus tá súil againn go bhfuil siad ag baint taithneamh as. Le focal scoir ba bhaith liom ‘Baile o Dhia oraibh’ a rá le muintir Mhóinteach ar fad agus go háirithe iad sin atá i Meiriceá (Na Dúbhagáin agus na Corcaid), atá i Sasana (Na Conceanainn agus na Dúbhagáin) agus sa tSéalainn Nua (Na Gralaigh). Ar an gCluain i mBaile Chláir na Gaillimhe, a rugadh Seán Ó Ceallaigh (sa bhliain 1916). Bhí an Ghaeilge aige ón gcliabhán. Chuaigh sé ar scoil sa Scoil Náisiúnta i mBaile Chláir agus i Meánscoil Naomh Seosamh i nGaillimh. hOileadh ina mhúinteoir é i gColáiste Naomh Pádraig i nDroim Conrach, Baile Átha Cliath (1934–36). Chaith sé ceithre bliana ag múineadh scoile ar an Oileán Iarthach i Ros Muc, seacht mbliana eile i nDoire Uí Bhriain i ndeisceart na Gaillimhe, agus le hocht mbliana déag, bhí sé ina phríomhoide sa bhunscoil i gCreachmhaoil, i gCo. na Gaillimhe. Bhain sé amach céim BA i gColáiste na hOllscoile, Gaillimh, sa bhliain 1955, agus bhí sé ina chúntóir i Roinn na Gaeilge i gColáiste na nOllscoile, Gaillimh, ón mbliain 1956 ar aghaidh. Bronnadh céim MA air i gColáiste na hOllscoile, Gaillimh, sa bhliain 1966 de thoradh a thráchtais Filíocht na gCallanán a chuir sé le chéile sa leabhar den ainm ceánna. Rugadh Micheál Ó Síoda ar an bPáirc Gharbh, Carn Mór, i bparáiste Bhaile Chláir ar an deichiú lá fichead de mhí na Bealtaine, 1888. Tá an Pháirc Gharbh tuairim a’s sé mhíle Éireannach soir ó Ghaillimh, an taobh ó thua den bhóthar atá ag dul go Muine Mheadha. Micheál a bhí ar a athair freisin—Micil Ó Síoda mar a tugtaí air—agus feilméaraí a raibh tuairim a’s fiche acra aige ab ea é. Máire Williams a bhí ar a mháthair, agus rugadh ise freisin ar an bPáirc Gharbh i dteach nach raibh mórán le dhá scór slat ón teach ar phós sí isteach ann. Deir an dream a raibh aithne acu uirthi gur bean í a raibh éirim agus meabhair thar an gcoitiantacht inti, agus ina theannta sin go raibh sí ina scoláire mhaith. Dúirt Micheál héin liom go raibh sí ar ghearr-scoil le linn a hóige a bhí i mBaile na Creige, tuairim a’s míle ón bPáirc Gharbh, ag fear den ainm Grimes. Bhí gaol aici le gréasaí i mBaile Chláir a raibh Tom Williams air. Bhí a mhac, Tom eile, ag gréasaíocht ann ina dhiaidh, agus mac eile Mike, ina bhuachaill posta ar fea blianta fada sa gceanntar. Cailleadh Máire Williams i 1909, agus Micil Ó Síoda i 1912. Ba dh-é Micheál seo againne an duine ab óige de mhuirín fhada. Éamon a bhí ar an duine ba sine den chlann, agus cailleadh é sa mbaile nuair a bhí sé ocht mbliana fichead. Ansin bhí Jude (Julia), an inín ba sine. Níor phós sí ariamh, ach d’fhan sí sa teach, agus is í a bhí ina bean-tí acu gur cailleadh í i 1952. Bhí sí trí nó ceathair de bhlianta os cionn ceithre scór an t-am sin. Ansin bhí Searlaí a chuaigh go dtí an Astráil ina óige agus a chaith blianta ann. Bhí sé ag obair sna gold diggings i Kalgoorlie. Thainic sé abhaile roint bhlianta os cionn dhá scór ó shin agus ‘pínneachaí aige’, agus d’fhan sé cúpla bliain nó trí sa sean-áit. Ansin cheannaigh sé gabhaltas thalúna i Monach Thaidhg, i n-aice le Creach Mhaoil agus chuaigh sé ’un cónaí ann. Phós sé bean de mhuintir Ghrállaigh as Mearaí i bparáiste Óráin Mhóir. Níor mhair sé ann ach achar gearr gur cailleadh é. Ní raibh aon duine clainne acu. Tá sé ráite gurb é deannach an óir a chuaigh i bhfastódh ins na scamhógaí aige sa Astráil ba siocair báis dó. Bhí cúigear inín eile ann, Bríd a cailleadh in aois a bliain a’s fiche, agus Máire a cailleadh nuair a bhí sí in aois chúig bliana a’s dá fhichead Níor fhág an bheirt an baile ariamh, agus cailleadh gan phósadh iad. Ansin bhí Neilí agus Katie agus Liz. Chuaigh an triúr acu go dtí an Astráil—is é Searlaí a chuir fios orthu agus a d’íoc a mbealach amach. Phós an triúr acu ann, agus tá a gclann ann ina ndiaidh. Chuaigh sé ar an scoil náisiúnta ar a’ gCarn Mór, scoil nach bhfuil ach dó nó trí chéadta slat ón teach. Beirt bhan a bhí ag múnadh ann an t-am sin, Bean Uí Cheallaí, Cúig-Ulach as Dromore, agus an cúntóir a bhí aici, Bean Mhic Ghamhna. Bhí an bheirt acu pósta le póilíní, agus ní raibh focal Gaeilge ag ceachtar acu ná aon mheas acu uirthi, rud nár fhág aon mheas ag Mike orthu héin. D’fhan Mike ar scoil go raibh sé ins an rang ab airde, agus chaith sé bliain eile ar scoil Bhaile Chláir. Dúirt sé liom gurb é an fáth a ndeacha sé go scoil Bhaile Chláir, go raibh an Ghaeilge ghá múnadh inti. Gaeilgeoir dúchasach as na Forbacha, toabh thiar de Ghaillimh, Seoirse Mac Artúir, a bhí ina phríomh-oide inti ag an am sin. Fear mórán ar an airde chéanna ab ea Patch, ach bhí sé níos téagaraí agus níos láidre. Dúirt sé liom uair amháin nach ndeacha sé ar scoil ariamh ach ceithre lá, ach bhí an fhíneáilteacht chéanna ag roint leis a bhí le Mike. Fear tuisceanach stuama a bhí ann, agus é deaslámhach. Bhí sé in ann claidhe maith cloch a dhéana, agus cuid de úirlisí an tsiúinéara a láimhseáil le mar bheadh gádh leis, agus go leor rudaí eile. Bhí foghlaim mhaith ar Mhike nuair a bhí sé réidh le scoil Bhaile Chláir, agus shílfeá go mbeadh rún aige anois ‘posta a chuir roimhe héin’, sin nó dul thar sáile mar rinne cuid eile den mhuirín, ach má smuintigh sé ar a leithid, níor chuir sé i gcrích é. Níorbh fhurasta dhó mar bhí a chúnamh ag teastáil sa mbaile. Bhí an t-athair ag eirí sean anois, agus ní raibh sa mbaile ach é héin agus Patch le obair na feilme a dhéana. Ina theannta sin fuair siad méadú mór ar an bhfeilm nuair a roinneadh dúiche an Charn Mhóir, agus bhí cuid den tala nua a fuair siad dhá mhíle ón teach, rud a chuir stróbh mór orthu. Dúirt Mike liom uair amháin nach Síodach ó cheart é héin chor ar bith, go mba Ó Dúgáin an sloinne ba dual dó. Ar na Croisíní, áit atá dhá mhíle nó mar sin ó thua don Pháirc Gharbh, a rugadh a athair, agus Ó Dúgáin a bhí air. Nuair a bhí sé ina pháiste chuaigh sé ‘un cónaí le uncail dhó a bhí gan pósadh ar an bPáirc Gharbh—sean-Mhicheál Ó Síoda—agus ón am sin thug chuile dhuine Micil Ó Síoda air, agus lean an t-ainm sin ar uaidh sin amach agus ar a chlann ina dhiaidh. Ní raibh teora ar bith leis an stór seanchais agus scéalta a bhí ag Mike, agus bhínn ag cuir tuairisc leis cé uaidh nó cé’n chaoi ar eirigh leis é ar fad a chruinniú. Dúirt sé go mbíodh go leor daoine bochta—‘bochtáin Dé,’ mar thugtaí orthu—ar na bóithre an t-am sin, agus bhíodh siad ag fáil lóistín ins na tithe, cúpla oíche nó trí anseo, agus cúpla oíche nó trí ansiúd. Bhí cuid acu ag teacht mar sin, uair no dhó sa mbliain ar fea blianta, agus bhí meas agus ómós rómpu. Bhí leabaí le na n-aghaidh sa teach acu héin, agus shocráití an leabaí sa gcúinne cois teallaigh dhaofa. Bhí scéalta fada agus gearr acu, agus ‘chuile chineál seanchais, tairgín agus eile acu, agus ní bhíodh tuirse ar Mhike ag éisteacht leofa, agus ó bhí cuimne cinn ar leith aige, ní dhearna sé dearmad ar aon cheo a chuala sé uatha. Bhí fear acu a rugadh i gceanntar an Ghoirt, agus bhí go leor eolais aige ar Bhriseadh Eachroma. Bhí fear eile ag dul thart leath-chéad bliain ó shin, ‘Brother Michael’ a thugadh siad air, bráthair a briseadh as ord eicínt, agus is uaidh sin chuala sé go leor den tairgín a bhí aige. Dúirt sé liom freisin go riabh uncail lena mháthair ina chónaí i bhFuarchoill (Coldwood) in aice le Creachmhaoil—sílim gur Búrcach a thug sé air—agus go mbíodh sé ar cuairt aige go minic. Chuala sé go leor uaidh sin freisin, agus chuala mé ráite é, cuid mhaith den eolas a bhí aige gur ó Shean-Mhicheál Ó Síoda, ar labhair mé thuas air a tháinic sé. Bhí sé fiosrach i gcónaí i gcúrsaí mar sin, agus rud ar bith a chloisfeadh sé ní bheadh sé sásta go dtuigfeadh sé thríd a’s thríd é. Nuair a thugainn héin cuairt air taréis a bheith imí’ tamall in Árainn nó i gConomara nó in áit eicínt eile, ní fhéadfainn blas a dhéana an oíche sin ach ag cur síos ar mo chuid imeachta agus ag freagairt ceisteanna ar gach a bhfaca mé agus na daoine a casadh orm, agus bhí Patch ’chuile phioc chomh fiosrach leis. Bhí eolas mór aige ar luibheanna agus planndaí, agus bhí sé in ann ainm Ghaelige a chur ar os cionn leath-chéad acu dhom a bhailigh muid, agus muid ag siúl thrí na páirceanna. Cá bhfuil an fear eile le fáil a dhéanfadh é? Le peann agus páipéar a bhínn ag scríobh ó Mhike i dtosach. Níor thaithnigh an t-Eidifón leis donn ná dath, ach bhain sé ceart maith don tape-recorder nuair a fuair mé ceann acu. Is ar éigin a bhí fear ariamh ab fhusa scríobh uaidh ná é. Labhaireadh sé go mall agus go soiléir, agus thiubhradh sé greadadh ama dhuit. Dhá mba scéal fada é nach bhféadfaí a inseacht i n-aon oíche amháin, an chéad oíche eile a rachthá aige, dhá mbeadh sé cúpla lá nó seachtain, nó fiú mí, thosódh sé ar an scéal aríst go díreach san áit ar stop sé chomh maith agus mara mbeadh ann ach sos chúig nóiméad. Bhíodh Patch ag éisteach, agus déarfainn go raibh an oiread eolais aige ar na scéalta agus a bhí ag an bhfearr eile, mar dhá ndéanfadh, Mike dearmad beag ar bith, is beag ag baol go ligfí leis é! Scríobh mé píosa seanchais ó Phatch anois agus aríst, ach sin nuair nach mbeadh Mike sa mbaile. Oíche ar bith a mbeadh Mike ann, d’fhágadh sé an obair faoi. Is minic a theighinn acu taréis mo dhinnéir, agus d’fhanainn go mbeadh sé deireannach. Thugadh siad mo chuid tae dhom, agus ansin nuair a thuitfeadh an oíche lasadh siad coinneall i gcoinnleoir práise, agus leagadh siad ar chathaoir le mo thaoibh í. Ní raibh acu an t-am sin ach lampa ola, agus bhí siad ag déana amach nach raibh an solas uaidh sách láidir dhom. Go gcúití Dia a gcineáltas leofa anois! Níl mé chomh cinnte sin i dtaobh Mike, ach déarfainn mar’ chreid sé ar fad iad gur chreid sé cuid mhaith acu. Scríobh mé leagan den scéal coitianta sin faoi bhás Chromaill uaidh, agus nuair a bhí sé scríofa dúirt mé leis nach mar sin a bhí tabhartha síos sa history. Ní thaithneodh leis go gcaithfeá aimhreas ar bith ar aon scéal dhá n-inseodh sé. Bhí go leor eolais aige faoi Bhriseadh Eachroma. Bhí cuid dá shinnsir ag troid sa gcath sin, triúr dritheár. Maraíodh beirt acu, bhí sé ag rádh liom, agus thainic duine acu as. Ba dh-é an tríomha duine seo sinnsear Sean-Mhicheál Ó Síoda a thóig a athair isteach mar oighre. Is air a bhí an rímhéad Domhnach dhár thug mé soir go h-Eachroim é agus shiúil muid páirc an áir le chéile, agus chonaic muid sean-iarsmaí den chath atá bailí i dteach na scoile ann. Domhnach eile, achar gearr shal má fuair sé bás, thug mé suas ar an nGort é, agus nuair a bhí muid míle nó dhó taobh thuas go Cill Cholgain – ní raibh sé ann ariamh cheana—dúirt sé liom go mba cheart go mbeadh loch a raibh ‘Loch na bhFranncach’ air in áit eicínt ar thaoibh na láimhe deise dhúinn, mar gur ionsaíodh dream de na Franncaigh ann nuair a bhí siad ag déana ar Luimneach taréis Briseadh Eachroma. Ceart go leor, nuair a chuaigh muid scathamh eile, chonaic muid an loch. Dúirt sé liom gurbh ó’n seanfhear siúil ón nGort a mbíodh siad ag tabhairt lóistín dó fadó a chuala sé an scéal sin. Cailleadh Mike ar an 29 Deire Foghmhair, 1966. Cailleadh Patch roint blianta roimhe sin ar an 10 Márta, 1962. Tá siad curtha i roilic Leacaigh, buil a sinnsir. Beannacht dhílis Dé agus na hEaglaise lena n-anam! Seo mar leanas scéal a d’inis Séamus Ó Mórain dhom as Cathair Ghabhain, ar imeachtaí an t-sean t-saoil agus an cruatan oibre a bhí ann fadó. Níl tuiscint ar bith ag an dream óg atá ag eirí aníos anois ar an saoil sin. “B’as Mointeach mo mhathair, bhínn feín ag dul isteach ann i mo leath-ghasúr ag tabhairt cúnamh do m’uncail leis an obair. San am sin, nuair a thagadh an bhaisteach i ndeire an tsamhridh, sceitheadh an abhainn ina thuillte, ba gheall leis an bhfarraige mhór siar go Loch Corribhe í. Leis an mbád a chaithí an féar agus an mhóin a bhailiú agus a thabhairt abhaile. Go h-iondiúl beirt a bhíodh sa mbád, an fear deire le cleithe leis an mbád a stuiriú agus an fear i dtús an bhaid le sluasad, le í a choinneal amach as an tanaí. An lá seo, ar chuma ar bith, bhí muid ag bailiú an féar as na cocaí on mbád, séard a bhíodh muid ag deanamh, na an féar i mbarr uisce a bhailuí agus an bun a fhagháil ansin. Bhí an lucht féir lionta againn agus muid ag deanamh ár mbealach ar an mbaile, mise i dtosadh an bháid ag cartadh leis an sluasad. Bhí an abhainn mhór taobh amuigh dhuinn. Bhí an oiread sin féar sa mbád nach raibh mé in ann an fear taobh thiar díom a fheiceaíl. Bhí seiseann ag fanacht le comhartha uaimse leis an gcleith a oibriú ar an domhain. Mise ba chionn t-siocair leis mar nár thug mé an fógra don fhear deire. Thanaig sineán gaoithe i ndeas, rug sé ar an bhféar agus chuir sé glan as an áit a bhíomar siar thar Gort Chluain Mór muid go dtí an áit a bhfuil an choill anois. Ní raibh muid in ann an bád a smachtú. I ndeire na dála, thainig muid ar chor san abhainn agus seídeadh isteach muid ar an tanaí arís ar an taobh thall. Thart ar an mblian míle, naoí gcead agus trí scór (1960), a thánaig fear darbh ainm Liam Ó Donnachú go dtí an paróiste seo. Bhí sé ina oifigeach Gaeilge le Coiste Oideachais Ghairm Beatha Chondae na Gaillimhe. Thánaig sé go Carn Mór ar dtús agus thosaigh sé ag plé le dramaí gearra agus le roinnt ceoil a mhúnadh. Bhíodh na ranganna i dteach na scoile agus d’eirí leis sathach maith. Bhí saol difriúil ann an uair sin le hais anois agus bhain cuid mhaith daoine spraoí agus taitneamh as na dramaí go háirid ar feadh roinnt blianta. Comh maith leis sin chuir sé roimhe craobh de’n Scoil Éigse agus seanachais a bhunú agus bhí rath ar sin freisin. Thagadh daoine a bhí sean go maith agus fir a bhí níos óige isteach sna céad blianta. Fir mar Mhicheál Ó Síoda (seanachaí cailiúl), Micheál Ó Ciarrgain, Seán Ó Cleirí, Micheál Ó hEidhin, Eamonn Ó hAinlí agus cuid mhaith eile. Bá ag cumadh píosaí is mó a bhí i gceist—filiócht agus dánta agallamh beirte agus scéalta. Blianta beaga ina dhiadh sin, chuir sé craobh de’n rud céanna ar bun i mBaile Chláir. Thagadh daoine mar Sonny Ó Ceallaigh, Seán Conceannan, Seán Ó Casarlaigh, Seámus Conceannan, Rocky Ó Moraín agus go leór eile isteach le freastal air. Thart ar chuile thrí seactainí ar an méan a bhíodh tíocht le chéile ann. Thainig bainistíocht nua i réim ins na scoileanna tar éis na chead blianta, nach raibh sásta na cruinneachaí a bheith ionta agus i dtighe conaí a bhíodh siad ansin. Is iomaí teach a caiteadh geimhreadh nó dhó ann, ach tigh Leacaí agus Tom Mac Bhailtéar (Qualter) i n’Gort Chluain Mór a thagadh na baill le chéile ar feadh blianta fada sa deire. Gach samhradh bhíodh Oll Chruinniú na Scoileanna Éigse ann, in áit éicint i gConamara agus thagadh thart ar bheirt ionadaí as gach Scoil Éigse eile le chéile chuig an gcruinniú agus bhíodh siad in iomaíocht le chéile agus thanaig cor dhuais go dtí an paróiste ó am go h-am. Bfiú go mór an rud ar fad. Bhí taobh maith soísialta leis, bhí spraoi agus spóirt ann, cuireadh aithne ar dhaoine agus cruithíodh cáirdeas. Chuaigh ceann Charn Mór i leíg do réir a cheíle agus scoireadh ar fad é sa deire ach lean ceann Bhaile Chláir ar aghaidh cé go raibh sé lagtha go mór nó gur eirigh Liam é fhéin as obair go luath ins na naochadaí. Ceád Slán leis an Scoil Éigse agus Beannacht Dé le h-anamacha na Mairbh. nuair a bhaist sé Eoin agus bhaist Eoin é.
aghaidh gach ball da bhfuil sa gcré. sé Mhuire Mháthair tri uair roimh a bhás. Bunaíodh Craobh an Achréidh deich mbliana ó shoin sa cheantar leis an gcuspóir an Ghaeilge agus an cultúr a chur chun cinn. Ciallaíonn ‘an Achréidh’ talamh cothrom. Is sin le rá an réigiún soir ó Chathair na Gaillimhe. Tá Baile Chláir na Gaillimhe i gceartlár an cheantair seo. Tá go leor imeachtaí ó shoin i leith a raibh baint mhór ag an gcraobh lena bhforbairt agus a gcur chun cinn. Tá dhá naíonra bunaithe sa cheantar ar thug an Chraobh cuidiú dóibh tosnú agus dul chun cinn a déanamh. Tá moladh ag dul do na stiúrthóirí atá i gceannas faoi láthair agus atá ag déanamh dul chun cinn chomh mór le forbairt na ngasúr sa chultúr agus sa teanga. Bíonn ranganna Gaeilge agus damhsa bliantiúl ar siúl sa cheantar ó cuireadh an Chraobh ar bun. Tá an Chraobh freagrach as an dá Champa Samhraidh atá ar siúl sa cheantar le deich mbliana anuas. Freastalaíonn leanaí ó 8 mbliana go dtí 14 bliana ar na campaí samhraidh seo. Tugann na himeachtaí seo cabhair an-mhór do na leanaí smacht a chur ar labhairt agus úsáid na Gaeilge. Mar sin tá moladh mór ag dul do na múinteoirí agus na daoine go léir a mbíonn baint acu le reáchtáil na gCampaí Samhraidh. Ó am go chéile thug grúpaí drámaíochta agus scoraíochta cuairt ar an cheantar le taispeántas a thabhairt. D’éirigh thar barr leis an himeachtaí seo. Thug muintir an Achréidh cuairt arais ar na ceantair éagsúla a ba’as na grúpaí éagsúla. Le cúnamh ón gCraobh tá cúrsaí Gaeilge ag dul ar aghaidh sa Ghaeltacht do dhaoine atá ag iarraidh feabhas a chur ar a gcuid Gaeilge. Tugann an Chraobh cúnamh le hAifreann Gaeilge a chraoladh ar Raidió na Gaeltachta ó ionad SMA Baile Chláir na Gaillimhe. Le linn bunú Gaelscoil de hÍde in Órán Mór thug an Chraobh cabhair airgid agus chomh maith leis sin thug baill den Chraobh cúnamh le gach bailiúchán leis an scoil nua lánGhaelach a chur ar a cosa. Thug baill na Craoibhe a gcuid ama saorinaisce agus doibridear go deónach chun an obair fhorbartha a dhéanamh ar an fhoirgneamh ina bhfuil an scoil nua lonnaithe. Bá mhaith leis an gcraobh ar an ocáid speisialta seo ár mbúiochas a glacadh leis na daoine ar fad a thug a gcuid ama agus saothair in aisce ó bhunaíodh an chraobh. Ba mhaith le coiste Craobh an Achréidh fáilte a chur roimbh bhaill nua le cabhrú forbairt agus dul chun cinn a dhéanamh ar labhairt ár dteanga.